5 Pages of Easter Kitty Cats ready for Easter Sunday. Cat, animal, adult coloring pages, digital, intstant download. BUNNY LOVE 10 digital coloring pages, downloads, digi stamps, color pages, Easter coloring, fun coloring, spring coloring. Join me on facebook for specials and coloring book news! What you can NOT do is re-sell my art as art or clip art or coloring books or pages. Basically you can not re-sell what I offer for sale. Here is the tricky part! If you are going to use my art for BIG COMERCIAL PURPOSES, which means mass produce my art onto a product of yours and sell, you will need to contact me and purchase a license. What is mass produce you ask? I have a wine company who uses my art for a wine labels, a t-shirt company who sells on line and in their store, a fabric company who uses my art for their designs. COLORING BOOKS COPYRIGHTS: You MAY copy my coloring books for personal use as many times as you like. You may also color your pages and sell them, you have my my permission and blessings! please post your pictures, I love seeing them. 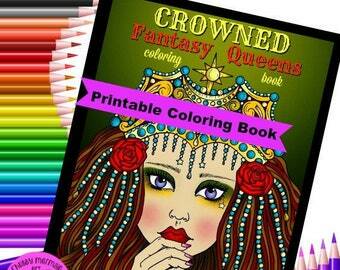 Printable Storybook and Fairytale girls Coloring book. Fun, cute, whimsical divas all dressed up and ready to color. Very upset with the shop owner. She did not specify that the image I was buying didn’t come separated and you would have to download a program that separates the Svg. I asked the owner for a refund, but declined because she said once you download it you own the image. I Also asked if I just can choose something else from her shop instead of a refund and still no reply. I am so sorry this happened. My policies do say no refunds on digital images due to copyright infringements. I can not just continue to give free images because the buyer changed her mind. My SVG's are standard and used by many people with no problem I tried to help but the buyer was set on getting another image free. One of four seasonal bunnies for my great grand daughter's future enjoyment. Anything by Deborah Muller is a treat to have. Very cute pictures to color. I love to sell my Art and Coloring Books at various Art nights and events. Marley is always at my side in my studio. She is a doodle, a labradoodle! Painting murals is a hobby. I even went to India to paint a huge temple with a mural. I love to walk on the beach with my dog Marley. Sometimes we collect shells or just Zen out at by the sea. My work can be found in Major stores like Walmart, Barnes and Noble, Target. I love seeing my books in stores! Dream Big!! 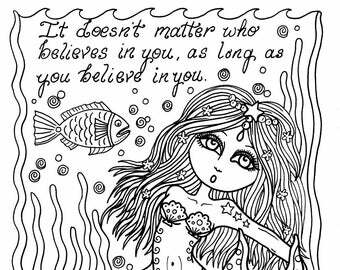 Never stop believing in fairy tales and mermaids. I've been a doodler all my life. I was a Henna Artist in Las Vegas for years so drawing images filled with swirls and lines, squiggles and dots just magically happened one day. 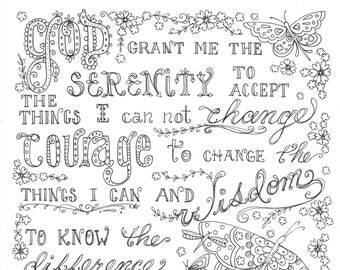 I began creating coloring books for my sweet grandchildren then they began to ask for more and more and suddenly I was getting requests from friends and family members for coloring books that catered to all ages. I have over 70 coloring books available and am always creating more. I love drawing and painting and I especially love creating custom pieces of art that people cherish and hang on their walls. Mermaids are my favorite thing to draw because I have lived in Key West Florida many times and I have always favored the beachy life. Retiring one day and living on a boat drawing and listening to Bob Marley all day is a true fantasy of mine. 2016 is going to be the year I fulfil my dream and live on a boat! UPDATE!!!! I moved onto my boat full time in August of 2016!!!!! Yay! Dreams do come true! My mind is filled with images and I Love creating so for me to sit down and doodle a whole coloring book in a week is easy. I just think of a theme, grab a pen and paper and go! Nothing can stop me when I'm on a creative high just ask my husband who does all the cleaning. I have a gypsy soul and love to travel and move around the country a lot. I have lived in over 30 states so far. We love to ride our Harley and Indian motorcycles in fact we started a motorcycle church in South Dakota a few years back. Marley even learned to ride on the back of mine. Freedom is a wonderful thing and every day is a journey so I try to just sit back and enjoy the ride. Art is my escape, my soul longs for paint and pens so I can honestly say this is my passion. The freedom Etsy has allowed me is amazing I feel like it was created just for me. I sell my books online and you can find them in most bookstores across the country! Mermaids come in all shapes and sizes! I love nature, the beach and animals. I create Art for the love of it! I can not go one day without creating something. I am blessed by my amazing life where I get to simply draw, paint and love. International Orders on coloring books should arrive in 10-12 working days. All single coloring books ship standard mail and take 7-10 working days. If you order more than 1 book it goes priority mail and is faster. Due to the nature of my items being art and digital I do not allow refunds or exchanges. Sorry, my books are not refundable because I have had issues with copyrights. Thanks for understanding. I use paypal. I accept all credit cards and checks through Etsy and paypal. 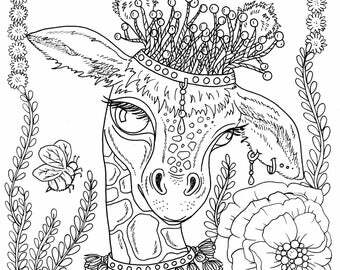 You may copy my coloring pages and coloring books as many times as you like for personal use. 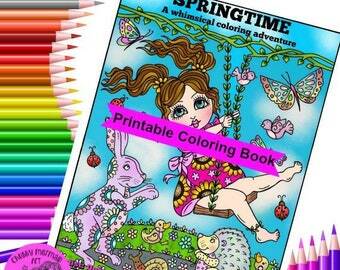 You may also color and sell your colored pages. If you are going to use any of my images for commercial use in your business please purchase one of my licenses or just convo me I will answer any questions you may have on using my art.